The new book by true investigative journalist Gareth Porter, Manufactured Crisis, summarizes the decade-long deception of the public about the nature of Iran’s nuclear program. It is not real news that the United States, Israel and the Iranian terrorist organization Mujahedeen-e Khalq (MEK) had joined in a big conspiracy in the successful attempt to isolate Iran internationally and impose on the Pariah state eventually crippling sanctions. However, since Porter bases much of his narrative on recent interviews with numerous insiders, among them former CIA and IAEA officers, some of whom only testifying after insisting not to be identified, the picture, which may have been blurred when just reading the quarterly reports by IAEA Director General on Iran, or David Albright’s interpretations, becomes clearer. A policy of denial since the mid-1980s, Natanz, George W. Bush putting Iran on an imaginary “axis of evil”, exploiting IAEA’s leverage for foreign policy, Fordow, Parchin, UN sanctions; and more sanctions. Well, Porter’s “alternative narrative” is biased as well. Painting Israel, the MEK and the U.S. as the sole villains in the play is not enough. Americans have asked, in particular after traumatic 9-11, “Why do they [the Muslims] hate us [‘Westerners’]?”, a question which can easily be answered by analyzing U.S. American foreign policy after WWII. But why do America and the West hate Iran? 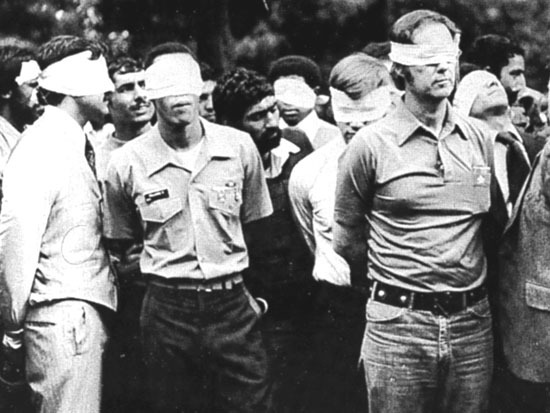 The 1979/81 hostage crisis and Jimmy Carter’s helpless attempt to free the American diplomats in his ill-fated Operation Eagle Claw is not mentioned in Porter’s book. As fact of the matter, America was at war with Iran ever since. The brutal Iraq-Iran war was just a proxy where Saddam’s war crimes had been tolerated if not facilitated by the Americans under President Ronald Reagan. Iranians had to pay the highest price. Of course would they be denied of nuclear technology, and anything else. But didn’t they deserve? The Islamic Republic under Ayatollah Khomeini, which emerged after the ouster of shah Mohammad Reza Pahlavi, was in fact a rogue regime which undoubtedly helped all kinds of terrorist organizations in the Middle East and conducted terrorist acts itself. It was another cold war, and the U.S. was lacking an arch foe after the collapse of the Soviet Union. Porter doesn’t explain why Iran strived for nuclear technology at all. It is indeed most likely that Iran seeks (and always sought) what is called nuclear latency, the “Japan option” of being in the position to quickly build a nuclear bomb if and only if a decision was made. Self-evidently, the U.S. and other world powers (P5+1) do not want that and cannot publicly discuss that since Iran is a member state of the Nuclear Non-proliferation Treaty (NPT) and has therefore the right to use nuclear technology for peaceful purposes. Since the Iranians eventually helped themself a “crisis” was inevitable. That any intelligence which would point to Iran’s peaceful nuclear ambitions was frankly ignored is not credible. It is more likely that realpolitik was made by several American administrations regardless of evidence for Iran’s peaceful nuclear program. American administrations’ policy is in fact to misinform the public, at least since the Vietnam war. In that regard, Porter’s book comes late. One may question whether now emerging aggressive and, as claimed, “fearless and adversarial” journalism by Greenwald et al. would have prevented such a decade-long manufactured crisis with its dramatic consequences not only for Iran but the whole region. Well, who knows? 7 March 2014 @ 10:30 am. Last modified March 7, 2014. This entry was posted in Book Review, Iran, USA and tagged CIA, Gareth Porter, hostage crisis, nuclear crisis. Bookmark the permalink.